ON-SITE PRINTED INVITATIONS AND ACCESSORIES, FAST TURNAROUND, NO QUANTITY MINIMUMS, EVERY OCCASION/THEME AND STYLE YOU CAN THINK OF! 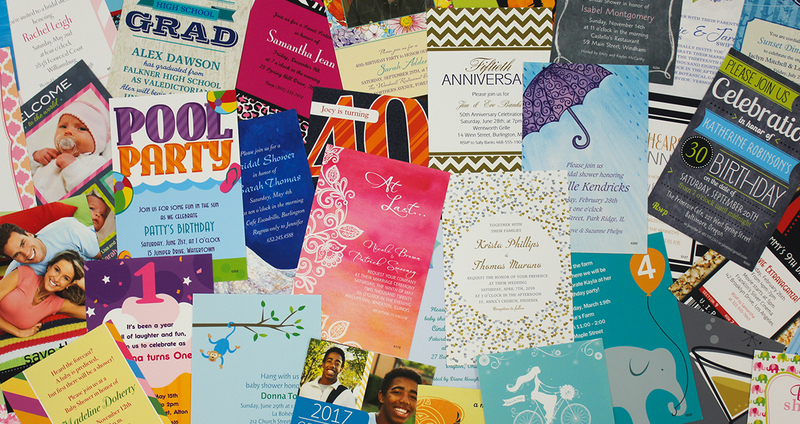 Invitations, Stationery, Stickers & more … all Printed On-Site! Start By Choosing your Design OR Occasion – Wedding, Shower, Birthday, Sweet 16, Bar/Bat Mitzvah, Christening, Communion, Quinceañera and More! Select a Typestyle & Customize your text! Customize your selection with your own personalized text and typestyle choice! Each InFinite Designs product is printed with your words in our store. You’ll even get to see a “Paper Proof” of your order! This gives you the opportunity to ensure that everything is correct before we begin printing. Most orders printed within 2-3 business days depending upon time of order and availability!